Upon a wronged—I would fain have said, a maid. Relate your wrongs. In what, by whom? Be brief. You bid me seek redemption of the devil. My lord, her wits I fear me are not firm. Most strange, but yet most truly will I speak. That Angelo’s forsworn, is it not strange? That Angelo’s a murderer, is’t not strange? Be an arch-villain. Believe it, royal prince. As e’er I heard in madness. Have sure more lack of reason. What would you say? To lose his head, condemned by Angelo. That’s I, an’t like your grace. For her poor brother’s pardon. Nor wished to hold my peace. I wish you now then. The warrant’s for yourself, take heed to’t. To speak before your time. (To Isabella) Proceed. Mended again. The matter; proceed. I now begin with grief and shame to utter. For my poor brother’s head. O that it were as like as it is true. And not have cut him off. Someone hath set you on. Thou cam’st here to complain. As I, thus wronged, hence unbelieved go. I know you’d fain be gone. An officer! My lord, I know him, ‘tis a meddling friar. Although this passage is a relatively long one, it seemed fitting to propose that we discuss Isabella’s complaint before the Duke, given some rather obvious resonances with some of the secondary reading for this week (particularly the Foucault). As Isabella brings her complaint before the Duke, Angelo immediately attempts to discredit her by portraying her as mad—thus removing her from “the common discourse of men,” as Foucault would have it (217), but also running straight into the dangerous potential for interpreting madness as a “rationality more rational than that of a rational man” (217). The Duke repeatedly notes that her discourse does not bear the appearance of madness, a comment which could of course lend itself either to the conclusion that she is not mad or to the possibility that her madness is simply the vehicle of a higher truth. Meanwhile, Isabella herself recognizes the difficulty of pleading her case and characterizes the matter repeatedly in terms of “strangeness,” calling upon divine power to verify that despite running contrary to institutional authority and expectations, the “truth” of what she is saying is so pure that it must be recognized. There seems even to be something oddly transactional about this use of “strange” and “true,” with Isabella and the Duke even bringing multiplication into the mix to describe the magnitude of the discourse’s transgression/truth, and the Duke later suggesting that justice would “weigh” Claudio’s behavior against Angelo’s. Lucio provides an interesting counterpoint to Isabella, interrupting her complaint in an attempt to corroborate the facts but being repeatedly shut down by the Duke, who criticizes him on the level of form (while granting the possibility that what he says may be “right”): regardless of whether Lucio is telling the truth, his speech is rejected by the representative of the judicial institution. (The interruptions also recall Lucio’s repeated interventions during Isabella’s initial interview with Angelo, pushing her to argue harder or approving her rhetoric from the sidelines, but remaining in that case unacknowledged.) Even more interesting, though, might be the way he attempts to play the situation at the end of this passage, once Isabella has left and the Duke finally turns his attention to him. Projecting his own controversial comments onto the Duke’s alter ego, Lucio undermines the authority of Isabella’s witness while the victim’s honesty is still threatened (thus also undermining the authority of a character he might expect to get him in trouble himself). In a sense, this hypocrisy mirrors the fault of Angelo, who prosecutes Claudio unjustly even after “weighing” himself against the convict in order to prevent Claudio from returning to complain on his sister’s behalf. Just as Angelo breaking his promise to Isabella multiplies his guilt (or should; the play retreats from this intensification and seems to justify it at a structural level through Angelo’s actual failure to kill Claudio, although this moves the ‘justice’ portrayed in the play away from its more typical portrayal of the state as a sort of guardian of ethics), Lucio’s attempt to shift the blame to the disguised Duke really just doubles his slander against the same person. What’s so surprising about Othello is not the ongoing differentiation of the idioms of the characters—but a stronger sense than we’ve ever had before, I think, that the idioms may come loose. In particular, we hear Othello lose his particular mastery (though he regains it at moments, poignantly); we hear Iago’s jagged, insidiously flexible idiolect of jabs and tests and sallies and oaths take hold of his general. Repetition becomes both instrument and object of the play’s inquiries, from Othello’s generous rehearsal of Desdemona’s praise to the rhyming couplets she exchanges with Iago to the compulsive and contagious iteration of words like “honest” to the refrain of the willow song. That has a lot to do with the ways that critics have heard the play’s music, beginning with L. C. Knight (“The Othello Music”). 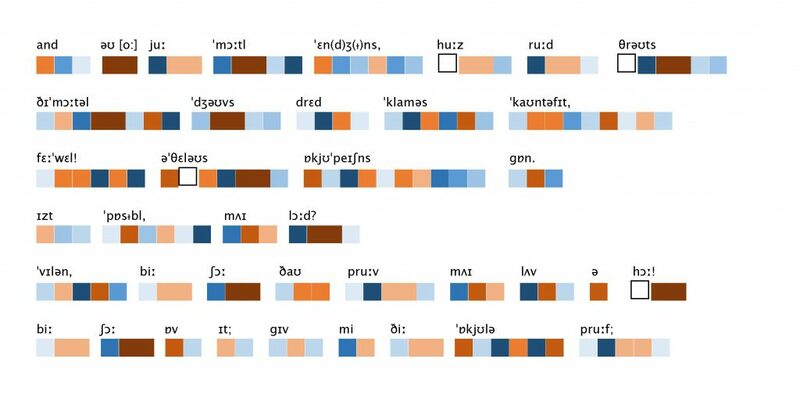 I thought Maddy’s phonetic diagrams—based on Bruce Smith’s chart of phoneme volume—were a fascinating exercise, right there on the boundary between what we can hear (or at least hear as pattern) and what we cannot (yet). The choreography of O-sounds toward and away from that dismal word “whore” was persuasively part of the passage’s power, something you could really hear once it was pointed out to you. (And so much criticism works that way, helping you hear something you might have missed by using a metalanguage to direct attention there.) 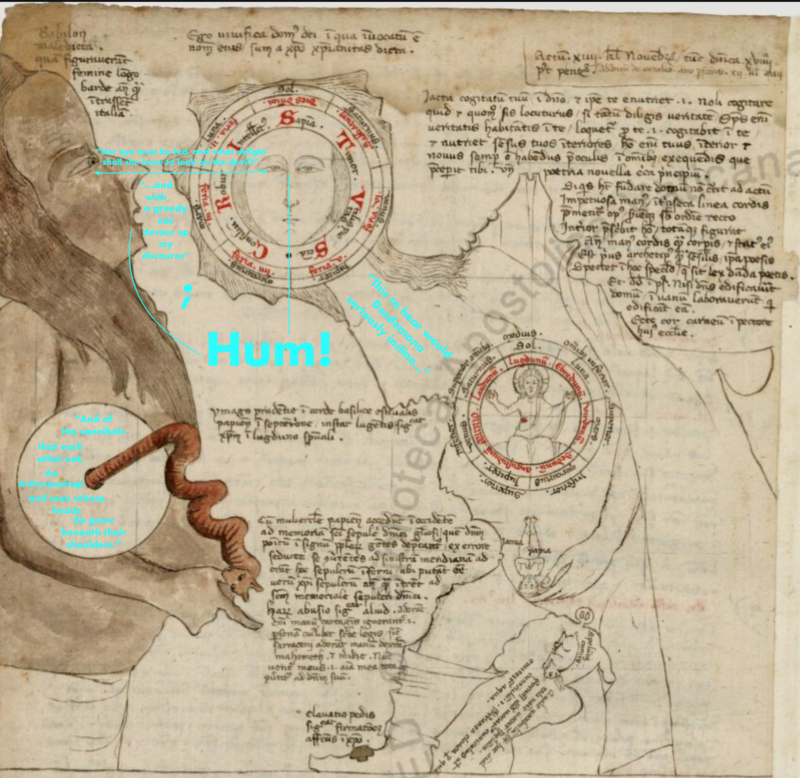 Whitney’s diagrams of vowel tones functioned much the same way. I think it’s a very interesting question, whether one could write toward those effects in the way one writes toward metrical expectations. It doesn’t seem like such a stretch to imagine a culture that prized such patterns; and indeed, with a little statistical restraint, it seems possible we might discover orchestrations already present in works we admire. I thought Jessica’s scene was brilliantly chosen, as a limit case of the damage that Iago does to the language of the play—so fragmentary, violent, scattered across the stage, hard to realize. Imagine writing it! And also, as she pointed out, it is at risk of being funny, ridiculous; and maybe that is true of more of the play, as its repetitions accumulate a kind of Bergsonian obsessive familiarity. The awful noise that accumulates (I loved John’s static for that) is maybe not so far from the rude noise of laughter. Important, too, that the scene is played out in the dark, as is so much of the play. Even if that is only a notional darkness, it does seem to make the dependence on sound the stronger. There are ways in which the question of the play’s sound entails the kind of pulling back from the particular lines that a structuralist critic might accomplish in thinking about structure or shape—a visual abstraction, sacrificing detail for a more general clarity. As we discussed, the capacity of sound (independent of language) for abstraction is severely limited. 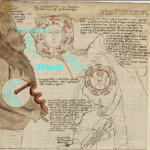 Nonetheless, we have a sense that sound changes in some gross and significant ways across the play—something like Bruce Smith’s pitch diagrams, as they show how a scene might move up and down the musical staff and the human larynx. I think Dolar can help us with the way voices contribute to that sound, as something between the cri pur and articulation. But voice is not the only contributor. There is also that damned bell. When we say something sounds like something else, are we invoking that middle register of sonic abstraction? Blurring the details to get a big sound picture (sound image, sound scape)? Though perhaps it is exactly a repeated detail that provokes a sense of likeness. I was so wonderstruck by the exercises. I will not try to comment on them any further here, except to say that I saw a few interestingly different kinds. There were 1) settings, with Yan’s and Mary’s both giving beautiful readings of the affective energies of their texts. I wonder, could one use music effectively to analyze other properties—motifs that might track interpretive interests, for example? Sarah and Maddy both rewrote the text as they set it; who knew, in Maddy’s bluegrass version, that there might be a ballad hidden in Othello’s report of winning Desdemona? A very interesting species of generic criticism. There were also 2) homophonic translations, from Will and Scott, which controlled for the sound by proposing (funny and ingenious) strings of sonically equivalent words. The difference between Scott’s approach and Will’s, the latter more concerned with the vowels, was interesting. Eli’s beautiful, visual sound-abstractions probably fall more or less in this category too. Who can say if one could learn to read such phoneme-maps as representative of artistic effects? But they were striking to look at and made me want to try. Then there were 3) non-linguistic visual diagrams of sonic phenomena, from Jeewon and Whitney and Maddy, all of which I thought were fascinating and rather beautiful; and all of which might just feed back into creative procedures. Then a couple, each in a class on one: 4) Andrew’s allegorical sound-map, and 5) John’s radio-static attention map, if map it could be called; perhaps the most explicit attempt (settings aside) to represent sound by another sound. Really resourceful. Coming up, after Measure for Measure, two weeks on movement and music, before our final omnibus session on The Winter’s Tale. As the end of the semester nears I’d like to work on bringing what we’ve learned to far together, and with that in mind I’d like to begin each of the next three classes with a ten-minute exercise a little like the sortes vergilianae (that old procedure of sticking your finger arbitrarily into the Aeneid and taking as counsel whatever you find there). In our case, we’ll choose a passage at random, take a few moments to think, then each of us say something by way of making a total sketch of its language—drawing on our resources of prosody, rhetoric, figuration, language history, sound, and of course all those tropes and schemes we have been hoarding up. Very much like the sort of synthetic exercise one might undertake in a (foreign) language class, keeping new knowledge ready at our fingertips. The lines reproduced above are a part of the tug-of-war between Isabella and Angelo. She asks for an abeyance of the law and he, of her chastity. The two discursive domains intersect in the social form of a woman’s plea. The form is a familiar one to our characters, for some of them even meddle with instructions on how to plead effectively. Within the scene, however, I want to focus on the bolded phrase and think about how this statement arises, why it is accepted as legitimate, how the response melds the discourse of law and love, whether the response appears elsewhere in different form. I want to think of “we speak not what we mean” as a metadiscursive act, one that not only references and describes a feature of the conversation at hand (pleading, making a case) but also functions as a discursive move on its own (analogous to but different from Berger’s meta theatrical). Which is a long-winded way of saying the line falls into the category of things we say about what we say while saying them—“It’s hard to understand you,” “Let me clarify,” “Do you see what I mean?,” and etc. I think this feature of the line is important because it is a way of staying within a discussion and stepping out of it, of participating and observing one’s participation in a discourse. We might care to keep this mind for when we might introduce Berger’s ethical questions. We may care to notice that “we speak not what we mean” leaves ambiguous where the negative sticks. When “we speak no what we mean,” do we say what we do not mean, or do do we not say what we mean? Do our words take on meanings we did not fully intend, when they are released into a discourse, where they gather implications and history we were not fully aware of, or are we just being plain duplicitous? The ambiguous negative coupled with Isabella’s use of the first-person plural implicates Angelo, for he does not say what he means. He occludes his motive in verbiage. And it takes Isabella’s “Let me entreat you speak the former language” for Angelo to say, “Plainly conceive, I love you.” This may be why, Angelo does not reply “Yes, it is” to Isabella’s retraction, for in saying, “we speak not what we mean,” she has not only made a retraction but also an accusation, one that eludes Angelo’s paraphrase. And it is here, in the implication of Angelo, in the doubling of retraction and accusation, that we might remember the line’s status as a metadiscursive act, one of participation and observation, and entreat it to Berger’s ethical concerns. What is the status of the accusation in relation to the retraction? How are they held together in the plea? Is Isabella responsible for the accusation as much as the retraction? What of her original statement and of Angelo’s paraphrase? How much of the conversation does she effect, and how much does she simply allow to happen? Does her self-conscious speech reflect an effort at self-representation? Does she hear herself, convince herself, that she is a chaste women as well as a good sister, that she has done everything she can for Claudio? Is her plea also an attempt to prepare herself for Claudio’s death after she has declined Angelo’s offer? How do we think about this scene in relation to her soliloquy, Berger’s privileged object of analysis, at the end of the scene? Afterthoughts to come, everyone, and in the meantime, here are this week’s sound exercises, quite an extraordinary variety and full of surprises. Jessica: text and commentary and image. That makes ambition virtue—O, farewell! Villain, be sure thou prove my love a whore! Is ’t come to this? To hang a doubt on, or woe upon thy life! I encountered many methodological challenges, and this is a rough approximation for sure, riddled with errors and best guesses. But it shows some connections I may not have made as a reader otherwise: the least intense phonemic combinations are concentrated in the beginning and end of the passage, giving the overall passage the visual shape of a bell curve; the first two lines I analyzed lack the intense /o/ sounds that pepper the rest of the lines and reach an apex arguably in “whore”—a keyword in the play that comes to describe each female character. “Whore” is doubly emphasized by echoing the sounds of Iago’s “lord” in the previous line and offsetting the high volume vowel with the low volume fricative /h/. 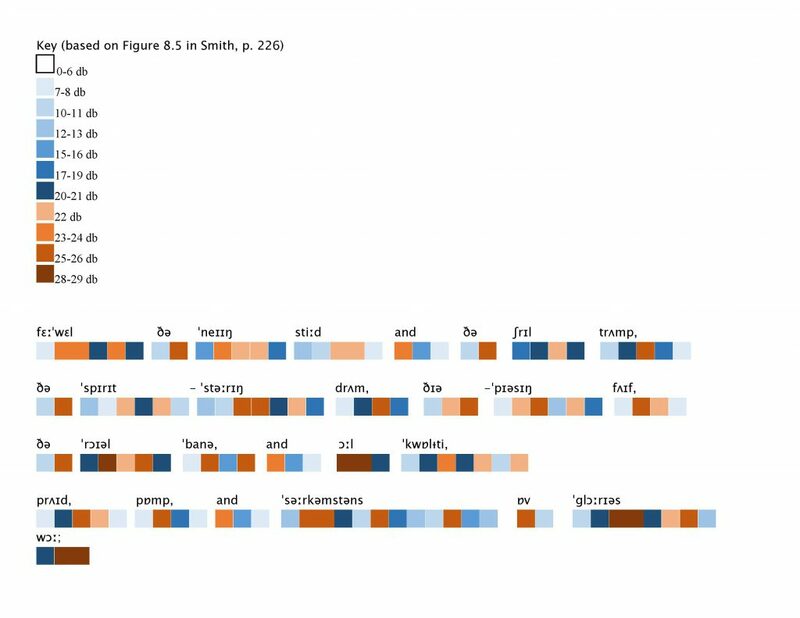 We can also draw connections between words based on their comparable intensities (“all” and “war”) or sound progression (e.g., those words like “steed,” “trump,” “spirit,” “pride,” and “pomp,” beginning and ending with low-volume consonants). I think we could productively question how far this exercise is useful or practical for depicting the sound/volume of lines that have so many other factors determining their shape; I’m interested in the tension between such an idealized phonemical analysis and the overall delivery choices that go into an actor’s performance, not to mention complicating factors like historical linguistic changes and regional accents. I’m wondering, though, if this sort of phonemical analysis could help us broaden literary concepts such as alliteration or assonance to encompass the physiological similarities between sound families, which give the line its sonic texture and seem to call for a certain kind of delivery? (One can hear Othello bitterly spitting out the plosives and fricatives that begin each word in “hadst been better have been born a dog.”) In other words, how do phonemes generate an affective register? How much is predicated on the contextual/relational? I’m interested to hear people’s thoughts on how phonemes, onomatopoeia, and soundscape are functioning here, alongside or against Othello’s other oratorical moments in the play. A few forethoughts this time, colleagues, since the moment is coming when we will have to plot our course for the final three sessions of the term. We will be reading King Lear, Antony and Cleopatra, and The Winter’s Tale; but with what questions in mind, and what texts to support us, is yet to be decided. My instinct is to leave the final class open, addressing The Winter’s Tale with whatever we have learned this term. For the other two, I see a few possibilities. One would be to summon up some other voices to stand alongside Shakespeare—Marlowe and Fletcher, for example, two of his collaborators. We would gain by this the external comparison that our concentration on Shakespeare’s self-difference (within plays and across time) has so far denied us. Another would be to read some Shakespeare criticism that addresses our questions, books about his language by the likes of Frank Kermode or Simon Palfrey or Janet Adelman. Our secondary readings so far have been mostly directed to different philological and theoretical contexts, but much has been written directly on our topic. (I have been channeling some of it.) Yet another option would be to continue in the vein of this week’s sound projects, with an emphasis on music (for one class) and movement (for another). I would bring in a couple of guests to work with us on what would be, for the likes of us graduate students and former graduate students, a more experimental program, but still dedicated to the exploration of Shakespeare’s language and to our agenda of imitation. You may detect that I have a bias toward the last, but I would like to sound us all out (so to speak); I think wherever we go, it will be interesting to take the temperature at this point, not least because everybody in the room who is officially a student is seriously considering becoming a teacher. So, such decisions are proper to us all, and I’ll be quite delighted wherever we end up. So: let’s take up the matter in class; but first, Othello! I know his gait, ’tis he! (Attacking Cassio) Villain, thou diest! I am maimed forever! Help, ho! Murder, murder! The voice of Cassio! Iago keeps his word. OTHELLO, (aside) It is even so. CASSIO O, help ho! Light! A surgeon! That hast such noble sense of thy friend’s wrong! And your unblest fate hies. Strumpet, I come. Forth of my heart those charms, thine eyes, are blotted. Thy bed, lust-stained, shall with lust’s blood be spotted. What ho! No watch? No passage? Murder, murder! ’Tis some mischance; the voice is very direful. Here’s one comes in his shirt, with light and weapons. Who’s there? Whose noise is this that cries on murder? IAGO Do not you hear a cry? Here, here! For heaven’s sake, help me! This is Othello’s ensign, as I take it. The same indeed, a very valiant fellow. O damned Iago! O inhuman dog! Kill men i’ th’ dark?—Where be these bloody thieves? How silent is this town! Ho, murder, murder! I cry you mercy—here’s Cassio hurt by villains. Light, gentlemen: I’ll bind it with my shirt. What is the matter, ho? Who is ’t that cried? Who is ’t that cried? My sweet Cassio, O Cassio, Cassio, Cassio! Who they should be, that have thus mangled you? I am sorry to find you thus; I have been to seek you. Lend me a garter. So. O for a chair to bear him easily hence! Alas, he faints! O, Cassio, Cassio, Cassio! Lend me a light: (Going to Roderigo) know we this face, or no? Roderigo! No? —Yes, sure!—O heaven, Roderigo! IAGO Even he, sir—did you know him? GRATIANO I am glad to see you. How do you, Cassio? [Calling] O, a chair, a chair! O, that’s well said—the chair! Was my dear friend. What malice was between you? What, look you pale? (To attendants) O, bear him out o’ th’ air! (To Bianca) Look you pale, mistress? (To Lodovico and Gratiano) Do you perceive the gastness of her eye? (To Bianca) Nay, if you stare, we shall hear more anon. Will speak though tongues were out of use. This was actually my first time reading Othello, and I’m afraid I might have missed something because I found it kind of…funny. There were moments when I could have laughed at the turn language? – speech, certainly, was taking, moments when characters’ verbal faculties seemed to melt down in ways it was difficult for me to imagine. There was Othello’s swoon, for one, though I could conceive of that in terms of pure emotional overdrive – but what about all the parroting, the lapses into mimicry on Iago’s, Emilia’s, Desdemona’s, Roderigo’s respective parts, often in conversation among themselves and/or with (especially) Othello? There’s Iago goading Roderigo on to “put money in thy purse” in 1.3; there’s Othello obsessing over Desdemona’s handkerchief in 3.4; there’s Emilia repeating after Othello like another broken record player in 5.2. And what about the as-yet-inconceivable (to me at least, and I haven’t yet seen any productions of the play) beelines performed in act as well as in speech by a cluster of characters at the start of Act 5? It’s this episode that I’d like to highlight for emphasis this week, if mainly to get a clearer grasp of just exactly what is happening – and why – among the disoriented company on stage. I was struck by the number recycled words and phrases, for one, but even more so by their apparent extraneousness, hollowness, and accordingly by an impression of inertia paradoxical for such a kinetic scene. The more closely I followed these sequences of verbal echoes, the longer my passage became; I could reasonably have excerpted all of 5.1 – but that would have been more unreasonable than the helping I’ve provided above. As you (re)read, note how many expressions bleed into multiple lines that, sometimes, fall at decent intervals from one another and/or carry into different characters’ speech. Does the repetition evacuate words of meaning here, or serve to escalate the tension of the drama? On the former count, note too the frequency of what Dolar would call ““prelinguistic’ phenomena” – all the “O”s, for instance, but also the groaning in the stage directions. One question I asked myself upon finishing Othello was: How does the play register doubt, insecurity, or confusion? Is this a scene that might exemplify the answer? To be honest, I couldn’t hear this scene very well (unless it were as poorly-scripted melodrama! ), but I could visualize it being pitch dark on the stage: Roderigo explicitly identifies Cassio by his gait, Iago enters bearing a torch, and the action depends on the lack of facial recognition, which the dialogue underscores by means of consistently questioned identities. Even so, I found the scene a little implausibly long, such that all the commotion lent itself to a kind of inertia, as I mentioned above. It wasn’t by accident that I also ventured to call the language here surprisingly hollow. If we imagine the characters acting upon strictly or predominately acoustic cues – engaging in a form of echolocation, as it were, especially with Cassio and Roderigo fixed in position on stage – could it follow that words are just sounds here? Or do the stakes of the action enhance the significance of the language? A comment in closing on a pattern I noticed throughout the play and will refer to as split or layered speech. Othello’s “letter-reading” in 4.1, like Desdemona’s song in 5.2, provides a great example of speech that takes multiple addressees or demonstrates divided attention, and Iago’s lines at the end of the segment I’ve quoted work the same way. This effect might be extended to occasions of suspended syntax or interrupted utterance (also asides), which suggest parallel trains of thought and/or expression and which occur rather often in Othello. Did you find this trend meaningfully pronounced in this of the plays we’ve read so far? And if yes, perhaps thinking along the lines I’ve sketched above, how so? I have done the state some service, and they know’t. This passage interests me for its interplay between spoken and written word, between hearing and reading as ways of receiving information. I also want to consider the association between sound and character. I want to begin by thinking about Iago’s self-sworn silence: Iago is the second-most vocal character in Shakespeare’s plays, with 1088, almost 25% more than Othello’s still-considerable 880 lines. I am not sure if this effect is noticeable while reading the play, and I would like to pose to the class whether this effect is noticeable while hearing the play. We think of Othello as an especially eloquent character – and his rhetorical flourishes of elaborate imagery and diction bear this out – but it seems plausible that the predominance of Iago’s voice might relate to the predominance of his influence in the play, perhaps operating at a much more fundamental register than merely his ability to influence the outcomes of the plot. Iago is, in many respects, a narrator, describing what we, or the other characters of the play, see: most prominently in his orchestration of what Othello sees and hears in 4.1 – but also earlier in that scene of what Cassio (and the audience) sees, his lie that “this is his second fit; he had one yesterday” (4.1.51) easily escapes notice. What is left, then, when that narration is silenced? 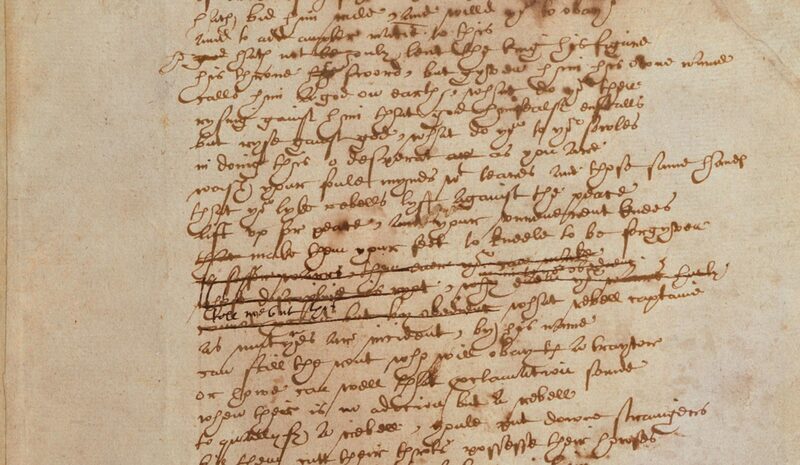 This passage at first seems to place ultimate explicative power in the written form by accounting for the “discontented paper” of “Roderigo’s letter,” but Othello’s direction to the Venetians pairs the spoken and written forms of communication. He says to “speak of me” in “letters,” to “set down” and “must you speak” and to “set you down this; and say besides” blurs the boundaries between written and spoken text. For Othello, the written account has itself power to speak, and this raises the question of sound a text itself might have. In films often when a character reads a letter one hears the voice of the writer; this is very different that how the recipient of the letter reads a letter aloud in a play (e.g. Othello’s letter-reading in 4.1). What happens, however, when we read to ourselves in private? Do we read in our own voice, and if so, do we do so exclusively, without “doing the voices” as a child might say in response to a bedtime story read aloud? And if we read only in our own voice, what is the effect of replacing all the different characters’ voices with only our own “fingerprint,” to use Dolar’s metaphor for the uniqueness of individual voices (545)? Although Dolar asserts that the uniqueness of voices “does not contribute to meaning,” I find this claim difficult to reconcile with the clear association in a play with voice and character; one potential counterexample would be that of a back-row, or very short, ground-floor audience member in the Globe who might not be able to see the action and thus would rely solely on hearing. I think this latter situation is analogous in to the silent experience of private reading – if it were not for indentations and character labels (i.e., features of the play that do not contribute to the meaning of the play), our silent reading experience would be as though hearing the play without the distinguishing characteristics of different voices. These afterthoughts come unusually long after, the break having gotten the better of me; but we’ll see what a longer interval has left in recollection. Before I do that, however, a nod to the exchange between Jessica and Will, which I think gets at some very basic questions for the project of criticism. We have indeed mixed some of the traditional questions of philological historicism with a few excursions, particularly into the polychronic and the multitemporal. Thinking about sound, especially if we take up some of Dolar’s suggestions, may also lead us away from our grounding in the moment of the text’s composition/play’s production/origination. Sound can be historicized, and that is what Bruce Smith is trying to do; but it is resistant to many of the descriptive technologies by which philology proceeds, if only because it hath a dying fall. I hope we’ll keep these questions alive, at least insofar as we take them to be Shakespearean questions; questions that the plays themselves propose and respond to. Here’s a proposition for our consideration: that literature has long been defined by, or let us say, been recognized by, its resistance to history, its independence from time; an impulse to speak beyond its time (if also, of course, and crucially, to and about its time). That ahistoricism itself is an impulse that takes different forms at different moments. You can historicize the ahistorical. What do you get for doing the reverse—supposing there is an alternative besides presentizing? I should say once again, I do not have fixed ideas here, but a general curiosity, and a sense that these questions are gathering rather than ebbing in the intellectual culture of our own moment, so worth conversing with. At moments of doubt, I worry that they are like merely conceptual art, where the idea is interesting to entertain but the encounter with the work leaves you a little stymied about what to do now. At other moments, it feels like such ideas and these works might be in real conversation. Anyhow, one place where I thought these questions got really interesting last week was in our discussion of the relationship between the historicity of language and the various kinds of time-feeling and time-idea inside the play. We made headway, I thought, with the contest betweeen periodic and running sentences in Hamlet’s soliloquys. The funny historical temporality of the classical period (as in periodic sentence), old/new in the humanist manner, felt always under pressure from the modernity of the running sentence—modern in the sense that Mueller describes, and in the way that form-breaking will often feel modern, when it happens. (Not a rule, of course; iconoclasm can be a primitivizing gesture. Anyway…) Simultaneously in play is their periodic sentence’s project of syntactic foresight, against a more interruptive syntax as a) a mimesis of distracted thinking or b) present-tense dramatic reaction. Maddy’s suggestions about the subjunctive folded the counterfactual into these questions, too, and of course the temporalities of the plot—delay, impatience, and so on. Each sentence seems to be pulled into past and future in ways coded in lexis, syntax, and figuration. With Jessica’s trick or treat in mind, a send-off from Kurt Schwitters, as himself and as performed by Christian Bok. Till Wednesday! Well, there’s little for me to add to Will’s keen, tactful comments except affirmative emphasis, and I think Eliot should get the last word.